Some people are very, very forgiving. I mean, you can’t blame the teens who threw themselves in front of your car between stints in rehab and their various arrests (fun fact, we also inspired the actual bling ring kids) but to befriend the people who caused you so much trauma, stress and a PR nightmare takes a special kind of person. Halle dropped over for breakfast yesterday; we think she may be scared to be around us at any event that could involve alcohol, which is fair enough but realistically when is alcohol not involved? Little did she know, we had accidentally spiked the batch of Halle Blueberry Waffles when we got into a fight and knocked over the last glass of our breakfast wine. Over brunch, we caught up on how much our lives had changed for the better since we first connected, the Oscars (she feels snubbed for not getting a nom for Catwoman) and her idea for a potential reboot of The Flintstones, set in the future (that we kindly pretended was great and not at all like The Jetsons). Thankfully the fresh, fluffy waffles went down better than her ideas with the exploding jewels of blueberry adding some fun to the occasion. We served them with some whipped cream, cinnamon and maple syrup, however they would work just as well with some butter and maple. Combine all dry ingredients in a large bowl, then whisk in all wet ingredients until smooth. Fold through blueberries. Melt butter into waffle iron to grease. Scoop the batter into the waffle iron and close. Cook for 2-5 minutes, then repeat. Halle Berry gave us a call on the weekend, reminded of the time we jumped in front of her car and caused an accident, by our catch-up with Lisa. (Yes, Halle was the unnamed actress we were planning to scam). After our stint in rehab (following our arrests and the attempted scam on Halle) and at the encouragement of our LA based mother-figures Lisa and Zsas, we connected with Halle as part of the making amends step of our program and we charmed the pants off her. What says, we tried to scam you out of your pre-Oscar millions and forced your car into the path of another car which led to you being fined for fleeing the scene of a crime and that we are thankful you forgave and befriended us? Picture source: Jason Merritt/Getty Images. Thanksgiving is such an appropriate time to catch up with Lisa as without her, Annelie and I would already have a Catch Me If You Can/Bonnie and Clyde-esque Lifetime TV movie made about us. We aren’t proud of our scamming days or that we lied to Lisa about it while living in her mansion, but we are thankful that Lisa is kind enough to give us a second chance (amirite Brandi)? Lisa and Giggy pulled up in the Bentley yesterday afternoon for a spot of tea and unlike most of the tea parties she goes to in Beverly Hills, this one didn’t end up in a brawl. 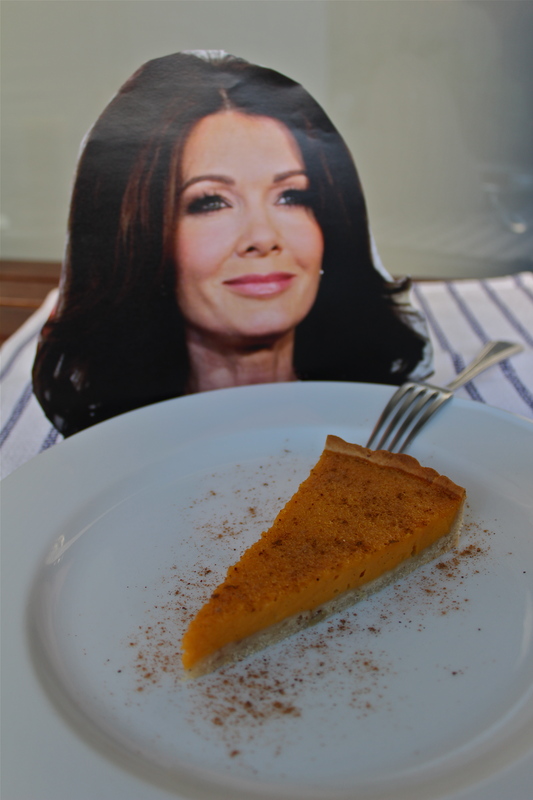 We sat down to a seasonally appropriate Lisa Vanderpumpkin Pie and talked about our resurgent fame, her relationship with Kyle and why we are so thankful that we have each other in our lives. 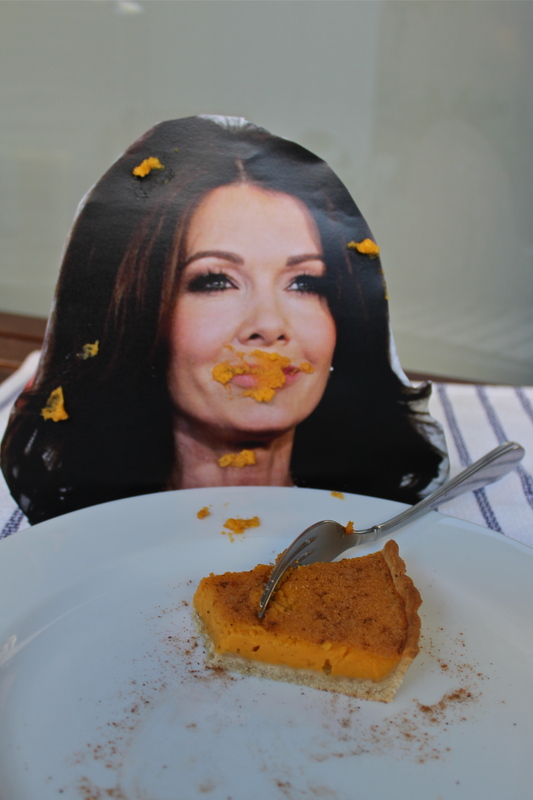 The filling was all at once delicate and robust with a hint of spice on a glitzed up version of Jamie Oliver’s shortcrust pastry, with maple and pecan. Sieve flour and icing sugar into a large bowl. Using hands, work the butter into the flour and sugar until the mixture resembles wet sand. Mix through maple and pecan, add eggs and work together until it forms a ball. If the dough seems too wet, add more flour until it is at the desired consistency. Don’t overwork the flour otherwise it won’t be short, as the name demands. Pat dough-ball into a disc, wrap in cling-wrap and place in the fridge to rest for 30 minutes. Dust a surface and a rolling-pin with flour and roll out the pastry until it is 5mm thick. Roll the pastry over the rolling pin, then unroll it into a 25cm loose-bottom tart tin (I’d go non-stick but I am crazy lazy) and push it into the sides. Trim off any excess dough and prick the base with a fork, cover with cling-wrap and place in the freezer to set for 30-ish minutes. Place pumpkin, milk, sugar, nutmeg, cinnamon, vanilla pod and seeds into a medium saucepan, over medium heat. Keep stirring until it comes to the boil, then reduce heat to low and simmer for 15 minutes stirring occasionally. Cook for a further 15 minutes, or until pumpkin is soft/tender/flaccid. Remove from heat, discard the pod and blitz with a stick blender until smooth. Leave aside to cool with the lid on. While pumpkin mixture is cooling, remove pastry from freezer and line with baking paper and blind bake with baking weights/beans/rice for 10 minutes. Remove from oven, remove baking paper and weights and return to oven for further 10 minutes. Beat the eggs for the filling (you thought we forgot, right?) and whisk through the cooled pumpkin mixture. Pour the mixture into the pastry case and bake for the 30 minutes or until it is set with a slight wobble. Leave to cool and then serve with a sprinkle of icing sugar and fresh vanilla ice cream. We first met Lisa when she witnessed us getting run over by an unnamed actress and she took us in and aided in our recovery (we were Cedric before Cedric). What Lisa didn’t know at the time, was that we were in our grifter period and had thrown ourselves in front of the car for a million-dollar paycheck. After a time of ugliness following the truth coming out, Lisa extended an olive branch knowing that we were young, stupid and in search of a life of diamonds and rosé. And Lisa can’t help herself when it comes to helping those she cares about. She gave us a buzz wanting to catch up for Thanksgiving while she was in town. What says thank you for seeing past our flaws to offer us your love, support and guidance? Picture source: Evans Vestal Ward/Bravo. I’ve never been more heartbroken at an airport than I was last night. Embarrassed sure (who isn’t when they are arrested for drunk and disorderly behaviour after spotting a colonial woman on the wings? ), but never heartbroken. As soon as Torz locked eyes on us, she started to break down in tears and ran to us for the supportive hug that she knew would be waiting. We stayed up most of the night talking through all that she has been going through (and wondering if her mother will ever give her, and us, a share in the wrapping room). It has been a tough time, but Tori is tough (she is the only one who could beat Shannen Doherty in an arm-wrestle) and we know she will be ok. 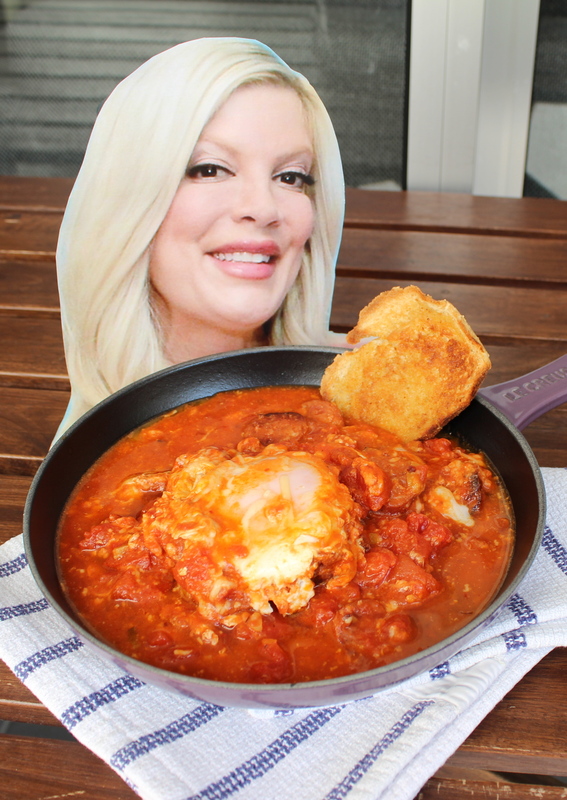 When she woke up this morning to a warm bowl of Eggs in Purgatori Spelling, she was in hysterics due to the symbolic nature of our meal and knowing that she had her humour back, Annelie and I were able to breathe sighs of relief. 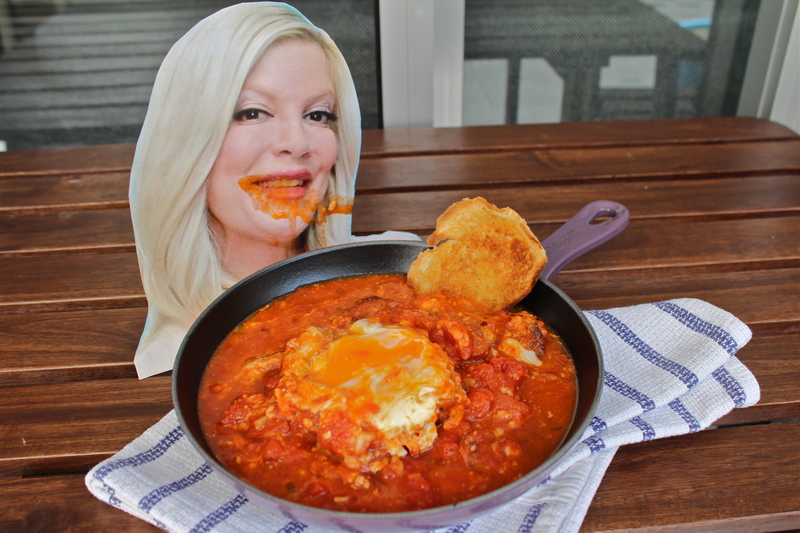 The fiery heat of the tomato base and the spice of the chorizo gave Torz the energy and motivation to pick herself back-up and once again become the strong, powerful, feminist icon that the world knows (the Donna Martin graduates storyline was an allegory for equal pay and women’s rights, included at Tori’s behest). Tori has her spark back and the delicious eggs were a bonus. Enjoy! Place a lug of oil in a pan (that has a lid) over medium heat, and fry chorizo, shallots and garlic until shallots and garlic are tender. Add chilli flakes and diced tomatoes and bring to the boil. Reduce heat to simmer and crack eggs into the tomato liquid, place lid on and simmer until eggs are poached to your liking. Serve with lots of buttery, sourdough toast. It seems word spreads pretty quickly when you catch up with one of the BH Crew. Torz called us the other day and sounded really down, what with her marriage woes and the axing of her and Jen’s comeback series it is understandable, and needed two of her closest confidantes (we still assume she wants to ride our latest wave of fame, but she is down so we will help). She is flying in late and spending a few days so we will need something for her first breakfast that gives her back that fire and helps her rebuild. What says, your heart is true, you’re a pal and a confidante? Where we lead, you can follow? You will get by with a little help from your friends? Hang on, I’ve reverted to (theme) song lyrics. It is so nice of Ellen to make her second trip down-under for the sole purpose of catching up with us and clearing the air after the furore we created for her show. She hasn’t changed a bit since that first time we met; so eager to embrace and foster new talent and give them a platform to succeed, while still being friendly and down to earth. She was literally flyin’ solo for the visit (she promised Portia would drop by soon…Annelie played the dancing baby opposite her in Ally McBeal), as she had guests she was hoping to secure in Australia. 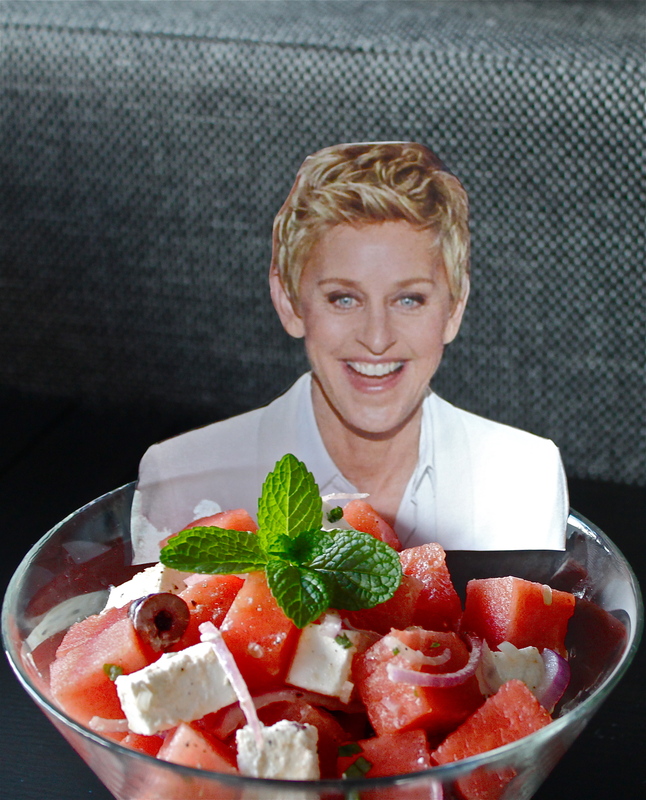 Knowing she was out on business, we quickly threw together a WatermEllen DeGeneres Salad to counteract the recent heat-wave and provide Ellen with refreshing sustenance for her important duties. There is something about watermelon, feta and olives that is inherently satisfying and indulgent and when you add fresh mint and the lime cured onion, you are left with the perfect combination of (almost)summer flavours. We quickly ate our meal, mindful of Ellen’s official duties, before she dropped the biggest news of the catch-up (no, they are still not having a baby)…she wants to have us on her show again! This time as socialite-celebrity cooks, rather than as the classically trained contemporary dance troupe, Jazz in Your Face. Our people are still talking, but stay tuned for our return appearance. In small bowl, combine sliced red onion with the juice of the lime to slightly cure. Dice watermelon and feta into similar sized cubes (I went with roughly 1.5cm dice), and place in a large bowl with the sliced olives and a generous handful of mint. Pour cured onion and juice into bowl with a good lug of oil. Toss (the salad) and season to taste. 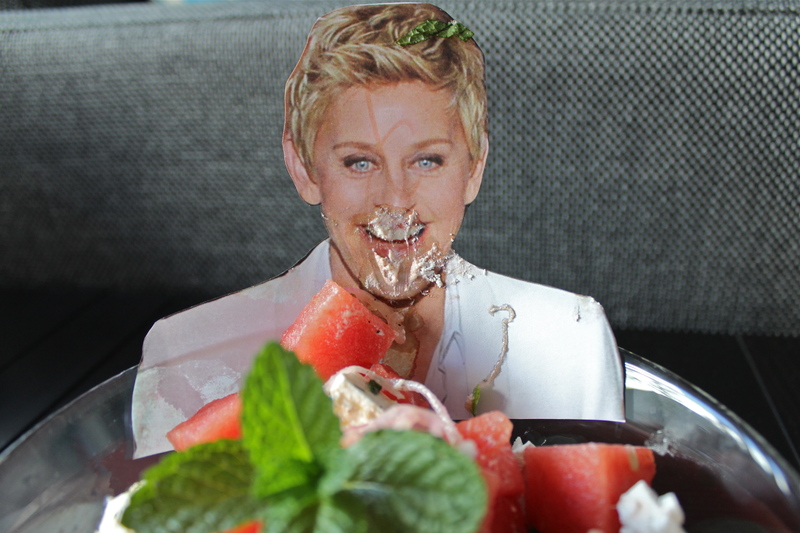 What a blast from the past it was to hear from Ellen today! Annelie and I first met Ellen when she was taking a lunch break during the recording of her role in Finding Nemo. We had just failed our auditions for Nemo and the flock of seagulls respectively, so decided it best to focus on our dance troupe Jazz in your Face; Ellen spotted us in the car-park and was impressed by our impromptu performance. Having only been witness to half of Jazz in your Face’s dance majesty, Ellen kindly invited us to perform on her then-upcoming talk show. The routine lead to a record breaking number of complaints for inappropriate behaviour and thousands of dollars in fines for Ellen. What says sorry we cost you so much money and nearly ruined your reputation as a talk-show host…and risked you being thrown off air in your first season?